Green campaigners have marched on Parliament demanding greenhouse gas emissions are slashed to help prevent "climate catastrophe". With UN delegates meeting in Cancun, Mexico, to hammer out a deal to cut global warming, thousands of campaigners marched through London. Hundreds of people in Hyde Park formed themselves into a "2030" with a giant zero - spelling out the date by which campaigners want a 'Zero Carbon Britain'. After creating the human 2030, campaigners cycled and marched through central London to urge the coalition Government to take strong action to decarbonise the economy and create a million green jobs in the process. 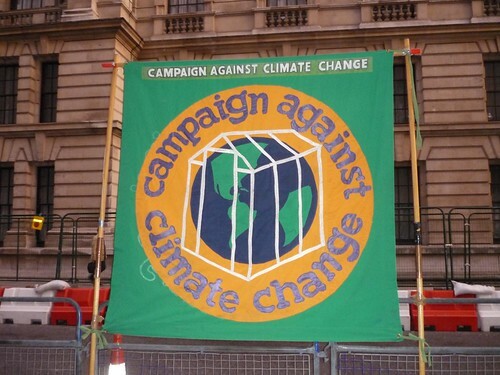 The climate rally was addressed by Green Party MP Caroline Lucas, Labour's John McDonnell and Michael Meacher and leaders of green organisations and unions. Larissa Stuart, spokesman for Campaign Against Climate Change (CACC), said: "There was a great atmosphere and the politicians made really rousing speeches. "We had lots of support from people and gave out lots of leaflets and really raised awareness." Ahead of the march, Phil Thornhill, also from CACC, said: "Gridlock in the international negotiations does not stop the slide towards climate catastrophe gathering deadly pace - as we have begun to witness this year in flood-stricken Pakistan, drought-hit Russia and other places. "It makes it all the more crucial that we transform the politics behind that impasse and we can start at home." Friends of the Earth's executive director Andy Atkins, who also spoke at the rally, said the "alarm bells are ringing loudly" and urgent action was needed to stop climate change.